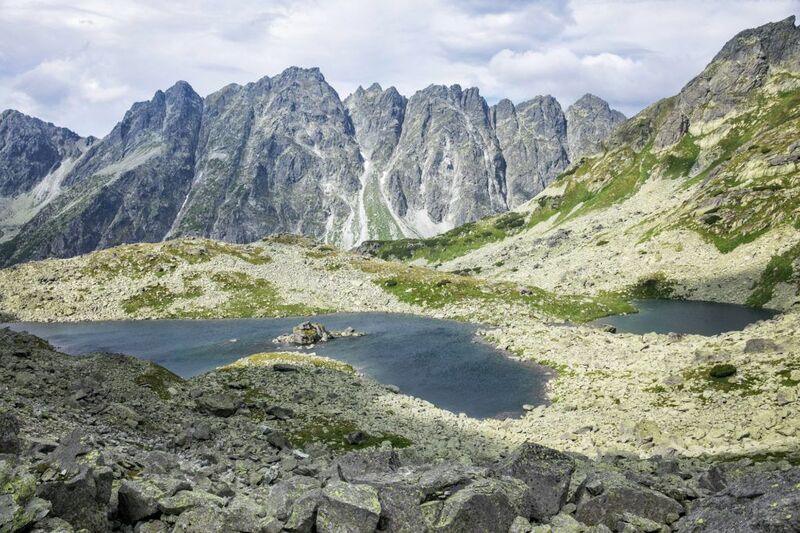 For stunning mountain views and a visit to several vividly green alpine lakes, the hike to the summit of Vel’ká Svišt’ovka is a good one to add to your Tatras hiking list. 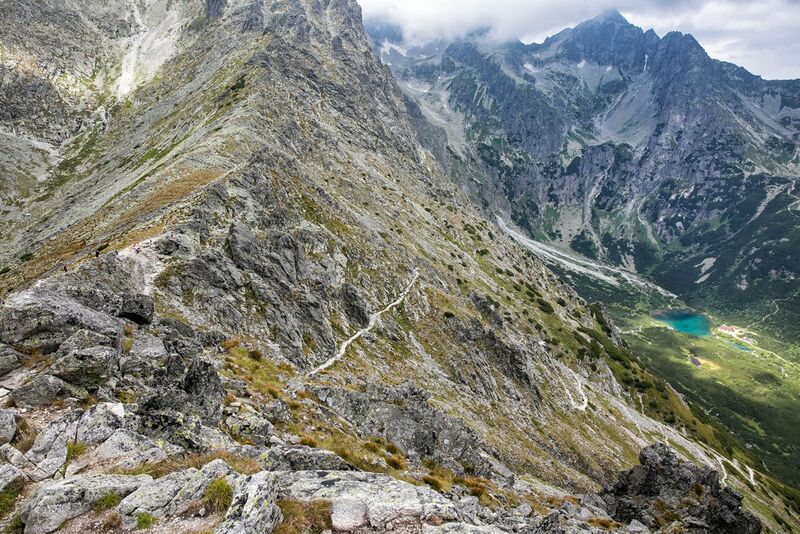 A cable car whops off the first major ascent, so this hike is easier than many of the hikes in the Tatras. Even so, this hike is not to be underestimated. This is a long hike, with a surprisingly difficult downhill section, parts of it requiring the use of chains. To get back into town, you also need to be prepared for what feels like a never ending walk through a pine forest on a rocky, uneven trail. Despite my warnings, this is a great hike. The views are gorgeous and the green lake was well worth seeing. Plus, sections of this hike are pure fun, which makes up for the long, monotonous walk at the very end of this hike. When to go: There are several signs posted along the trail that this hike is possible from June 16 to November 1. During the remainder of the year, the trail is closed, to prevent damage during the months when snow is present. 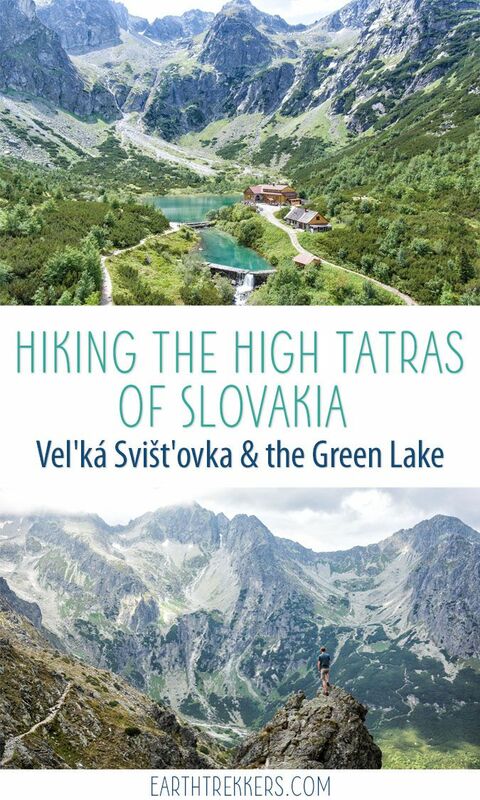 This hike starts at Skalnaté Pleso, a green, alpine lake located up in the High Tatras. To get here, you can hike up or you can take the cable car. I recommend taking the cable car. It’s fast, it’s scenic, and it shaves off roughly 2 to 3 strenuous hours of hiking. The lower station of the cable car is located in Tatranská Lomnica. There are three parts to the cable car. The first leg consists of two separate cable cars that take you right to Skalnaté Pleso (1,751 meters). To do this hike, this is what you want. 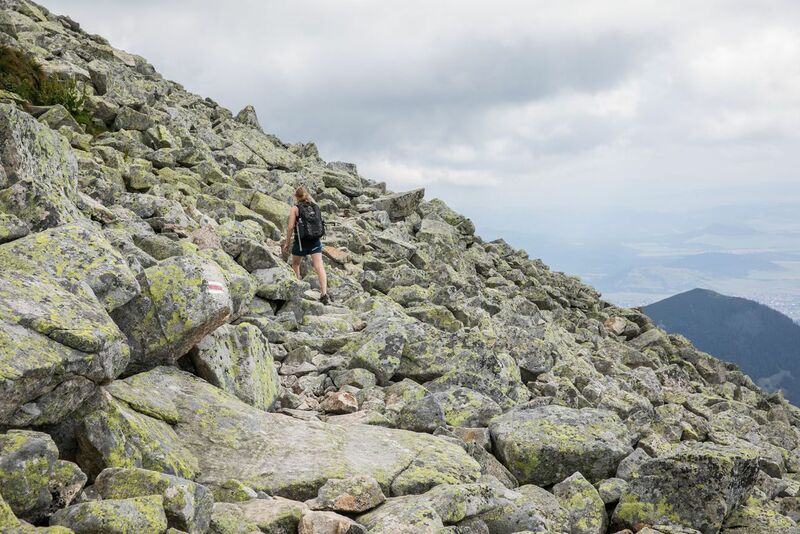 However, if it’s a perfectly clear day, you can pay more and journey all of the way up to Lomnický Štít, one of the highest peaks in the High Tatras. If you have clear skies, I think it would be worth the money (it’s expensive!). 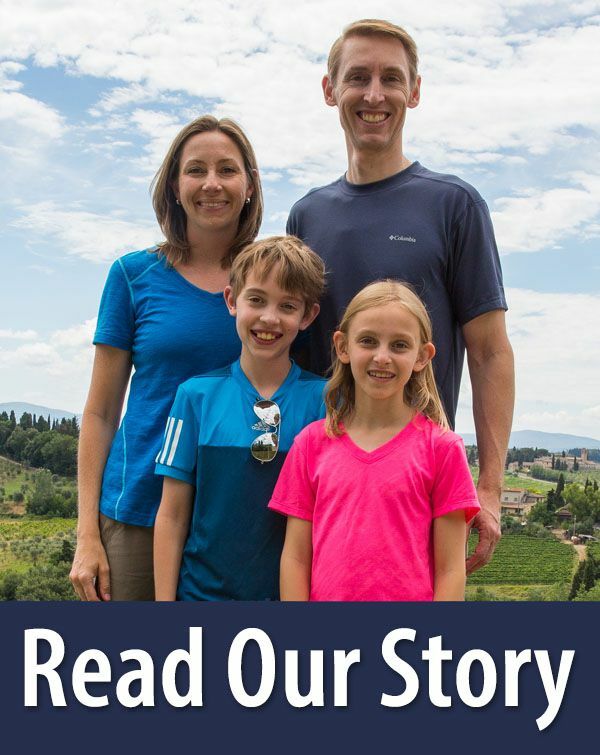 We were not so lucky. Low clouds hid the mountaintops on the day we did this, so we only went to Skalnaté Pleso. 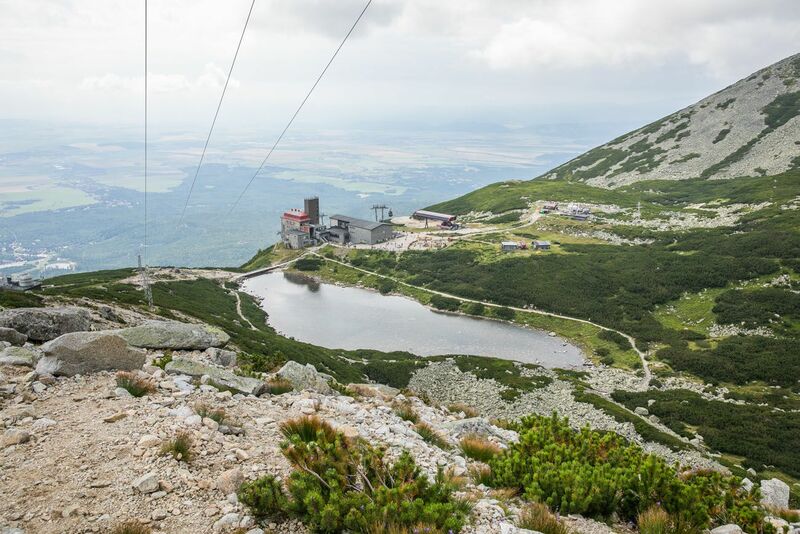 To get to Lomnický Štít (2,634 meters), tiny cable cars on very long cables slowly climb up to the peak. This cable car can only transport 45 people per hour, which is not much! In general, these tickets need to be booked 2 to 3 days in advance, since there are very few tickets available. 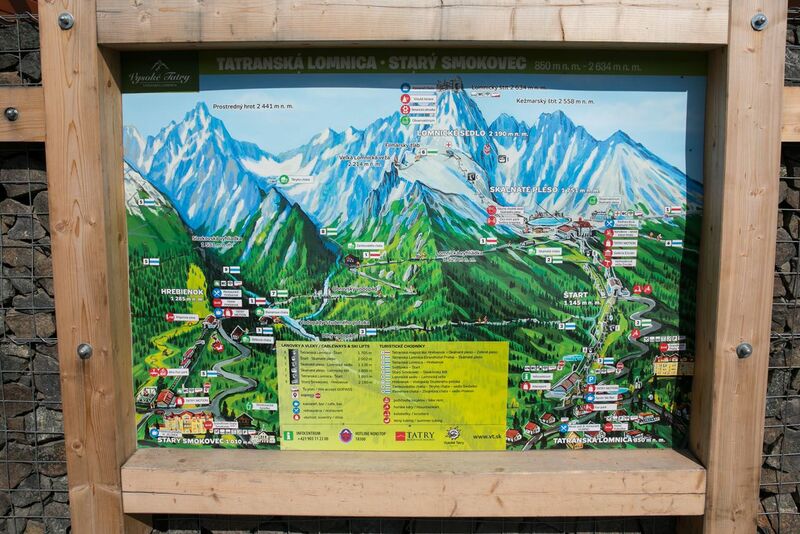 From Skalnaté Pleso, you also have the option to ride a chairlift up to Lomnicke Sedlo. This doesn’t take you as high as Lomnický Štít, but with an elevation of 2,190 meters, this is another way to get those high alpine views. 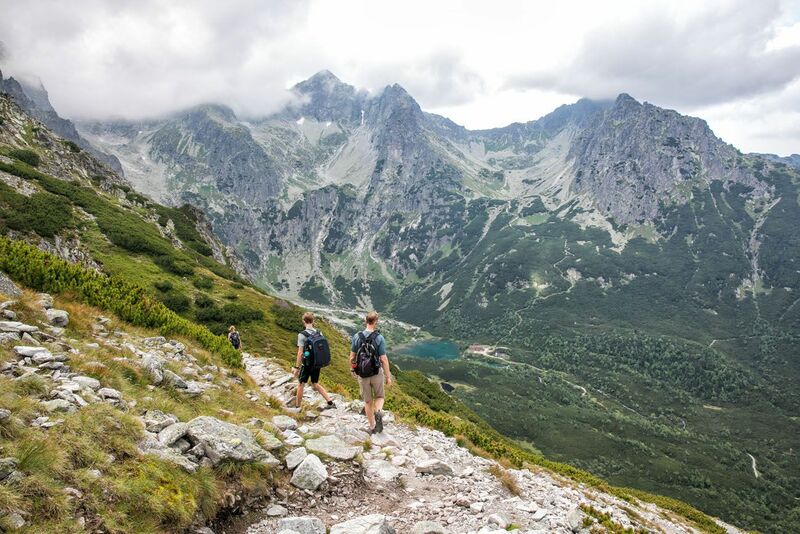 If you follow this hike how we did it, you will only need to purchase one-way tickets up to Skalnaté Pleso. If you choose to ride the cable car or chair lift up the mountain from Skalnaté Pleso, you can book this leg of the journey round trip. At the ticket office in Tatranská Lomnica, you can buy your tickets for the cable car. 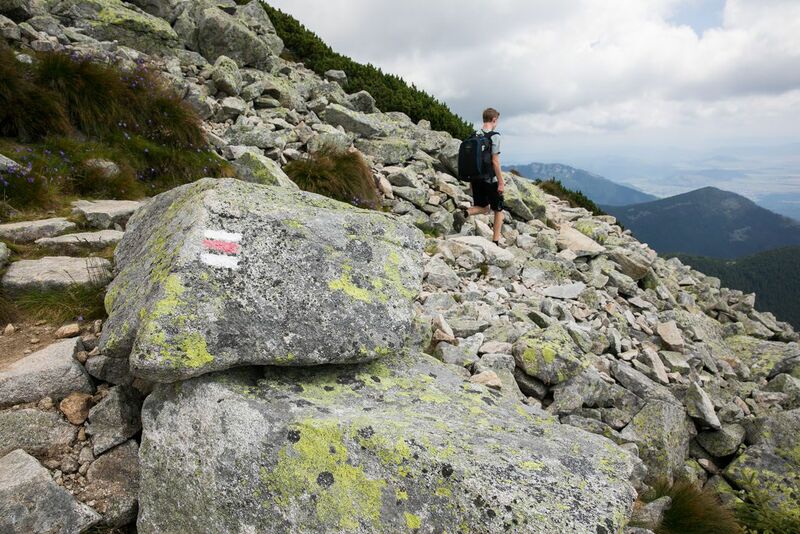 You can also purchase tickets at Skalnaté Pleso, if you choose to go higher once you are there. 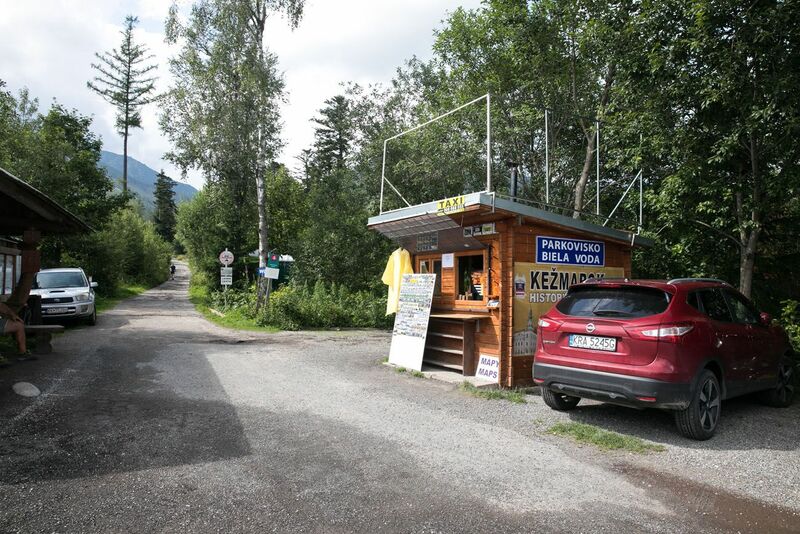 At Skalnaté Pleso, there is a small restaurant, souvenir shop, and bathrooms. 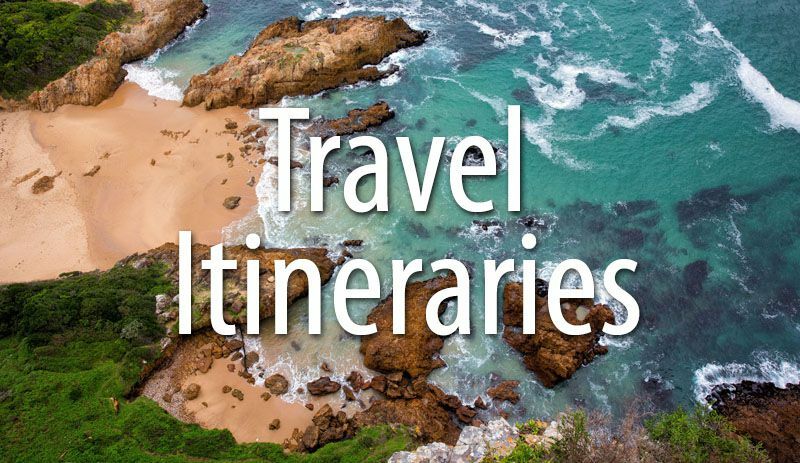 Pro Travel Tip: The official website recommends that you purchase your tickets several days in advance, because they do sell out. I tried to do this and could not get the website to work. But we had no issues getting tickets on the morning of our hike. We did this on a gorgeous Sunday in July. At 9 am, ticket lines were small and there were no lines to get onto the cable cars. I would recommend getting here at opening time, which is 8:30 am. This way, you skip the crowds and get a head start on the hike. Thunderstorms can roll in during the afternoon, so it’s a good idea to start your hike early in the day, if possible. Trust me about the thunderstorms…you’ll hear about those soon! The first cable car seats just four people and takes several minutes to get to the transfer station. At the transfer station, you get on a much larger cable car that can hold up to 15 people. On a sunny day, these cable cars get hot because of the greenhouse effect. It was wonderful to step out into the much cooler air at Skalnaté Pleso. Once at Skalnaté Pleso, exit the cable car and walk towards the restaurant. 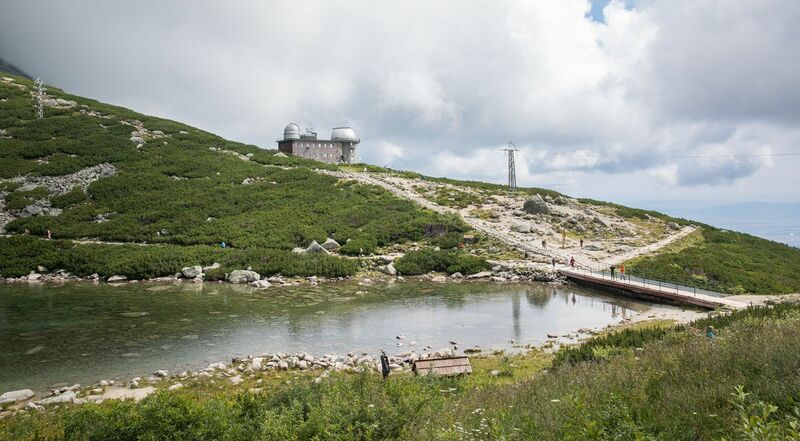 Walk to the left, around the restaurant, and in front of you will be Skalnaté Pleso (the lake), the cable car station to Lomnický Štít, and off in the distance, an observatory. The trail starts on the other side of the lake. There is a short section of planks that head up the hill towards the observatory. This is where your hike starts. For this hike, you will follow the red trail. Estimates are given in times, not distance. A short but slightly strenuous climb takes you uphill, in the direction of Lomnický Štít. This first climb takes about 15 minutes and then the trail levels out. Don’t forget to look back! 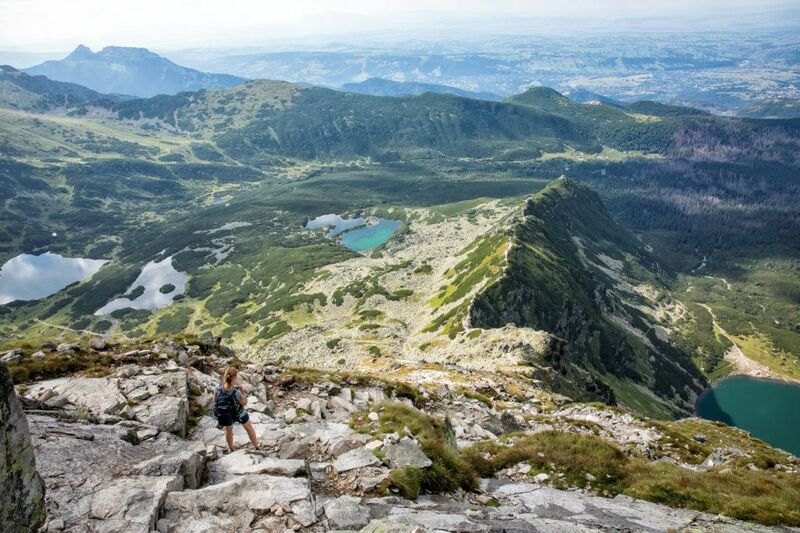 The views over Skalnaté Pleso and the towns of Slovakia are gorgeous from here. 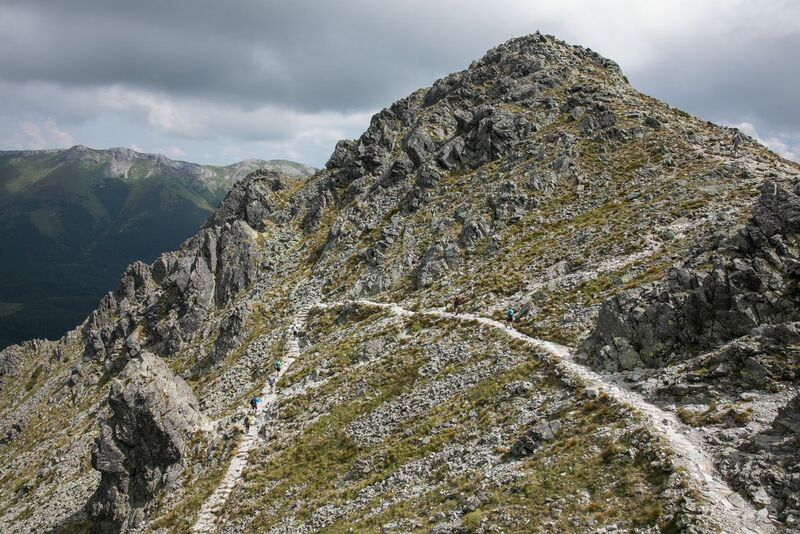 The trail undulates as it heads east towards Vel’ká Svišt’ovka. A large portion of this part of the hike takes you across a giant field of boulders. It’s a lot of fun, if you like this sort of thing, or it can be nerve-wracking, since some boulders can shift and slide under your weight. Once across the boulder field, the trail starts to climb some more. Now you can see Vel’ká Svišt’ovka off in the distance. It really doesn’t take too long to get here from the cable car. 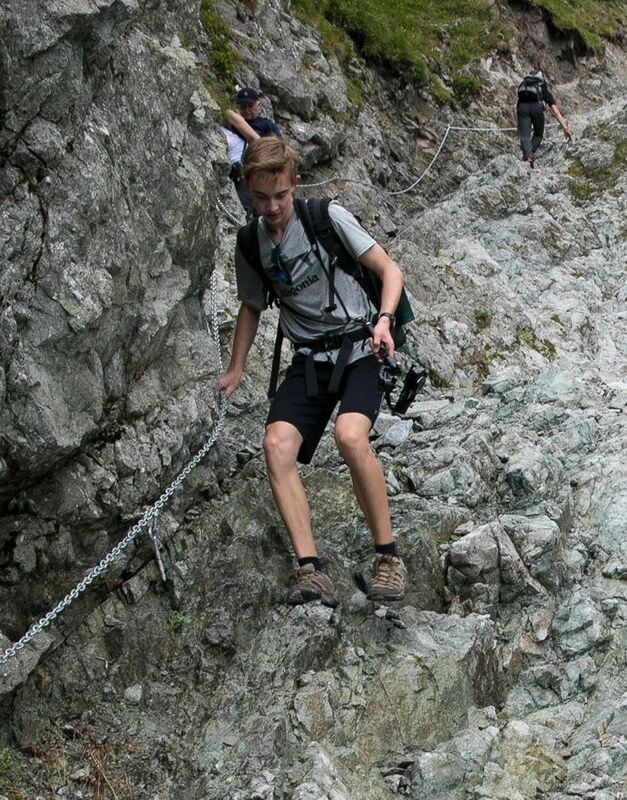 It’s one final, strenuous climb to the peak of Vel’ká Svišt’ovka. The views from here are the best of the day. 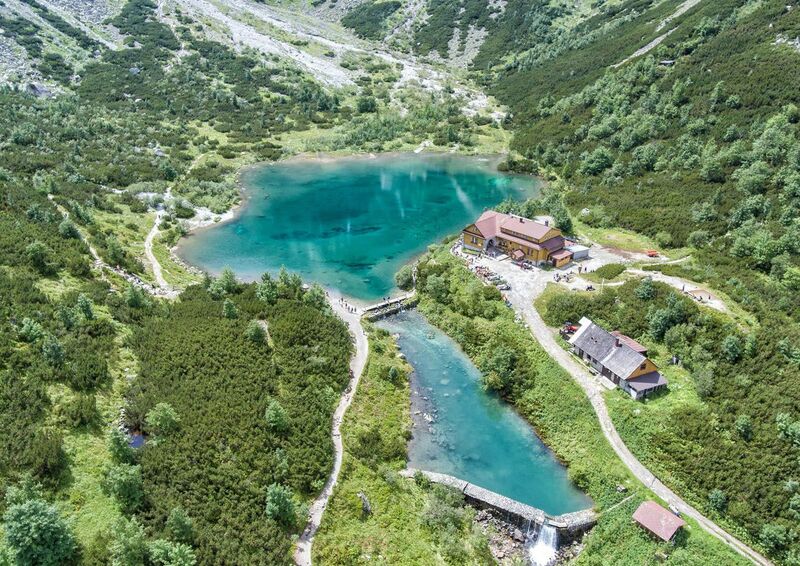 Now, you can look down at Chata pri Zelenom plese (the restaurant and lodge next to the lake), Zelene Pleso (the green lake), and the valley far below. 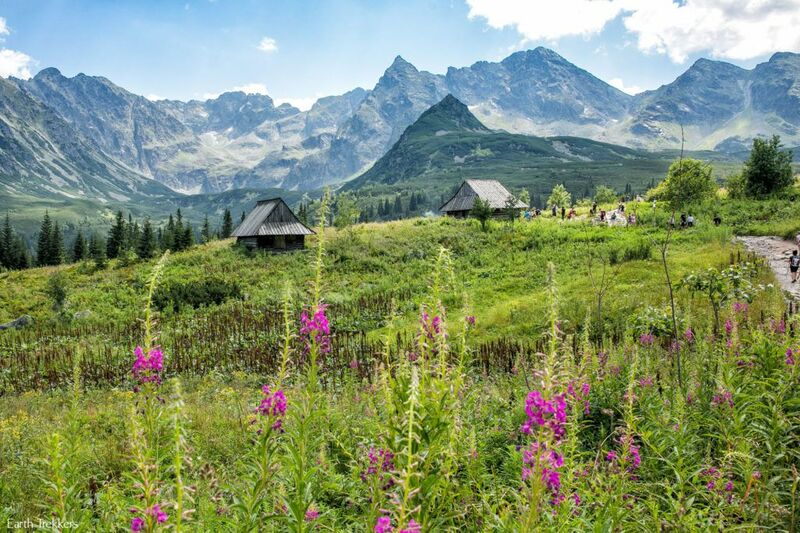 This lovely valley is surrounded by the high mountain peaks of the Tatras. And that’s where we are heading next. Looking up at the peak of Vel’ká Svišt’ovka from the saddle. 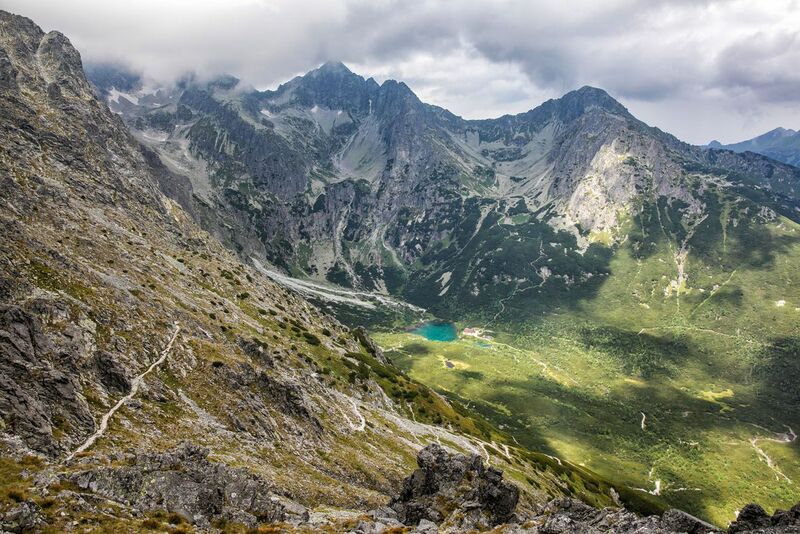 The view from the top of Vel’ká Svišt’ovka, looking back at the saddle and down to Zelene Pleso. 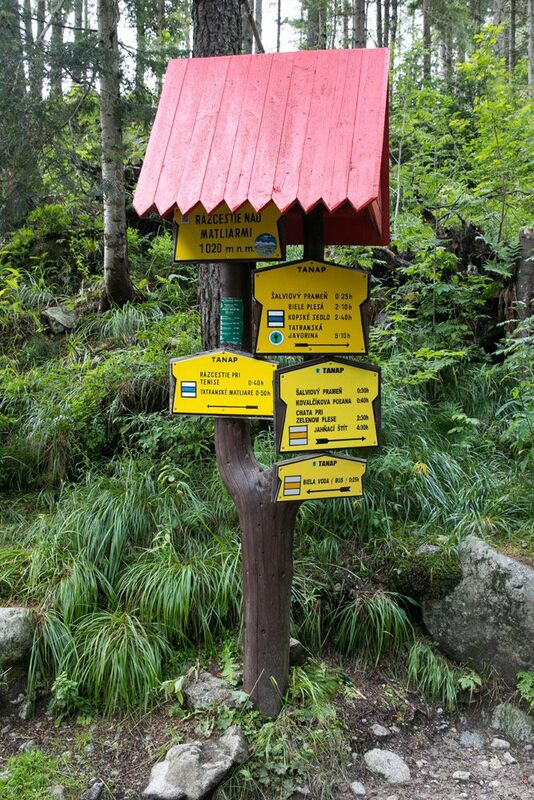 Alternative Finish to this hike: You can turn around at Vel’ká Svišt’ovka and hike back to the cable car the same way you came. 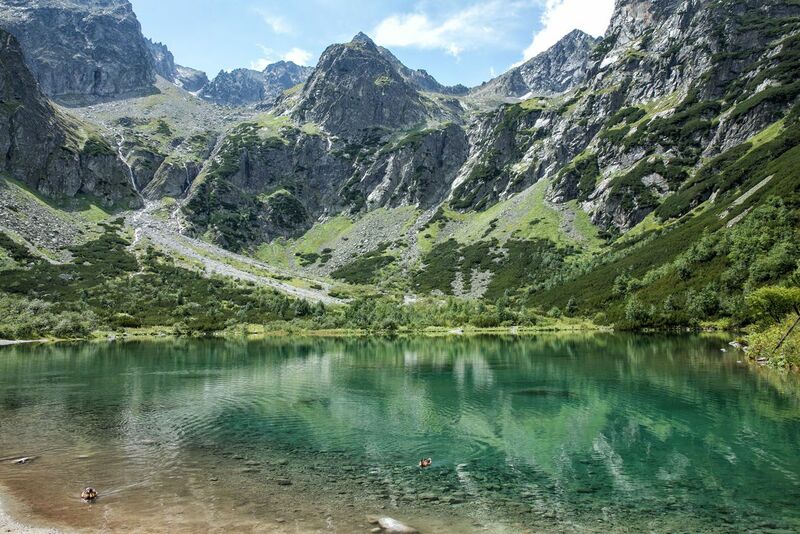 This will make the hike a lot shorter, but you will miss more of the views over the valley and the visit to the gorgeous, vibrantly green lake next to Chata pri Zelenom Plese. If you choose this option, you will need to purchase round trip cable car tickets to Skalnaté Pleso. 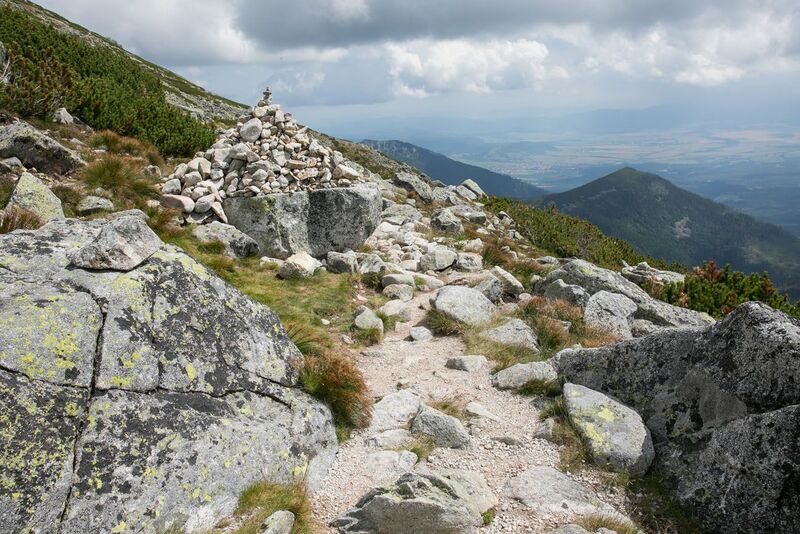 Once we reached Vel’ká Svišt’ovka, we could hear occasional rumbles of thunder off in the distance. Clouds were moving in and being on a mountain peak is the last place you want to be during a thunderstorm. And I had read that the storms can be wicked here in the Tatras. So we had to really get moving. 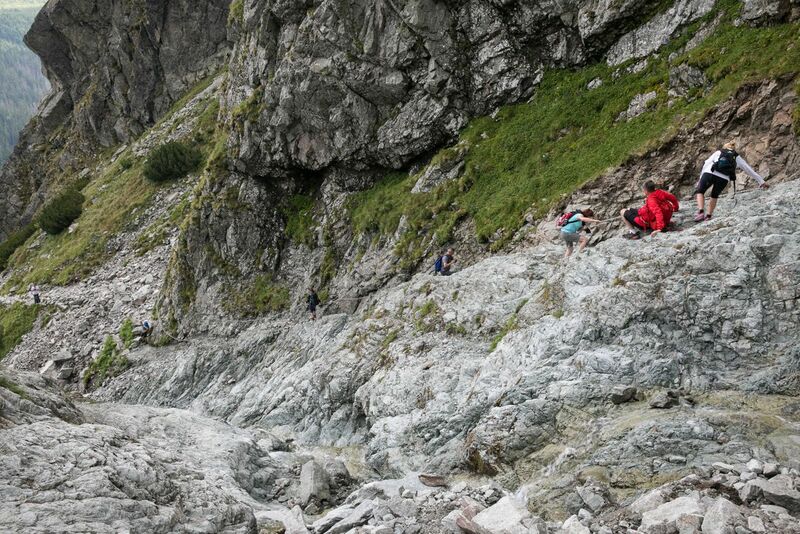 The hike from Vel’ká Svišt’ovka to the Chata pri Zelenom is, in my opinion, the most challenging part of this hike. It’s a long, steep descent on uneven, rocky trails. 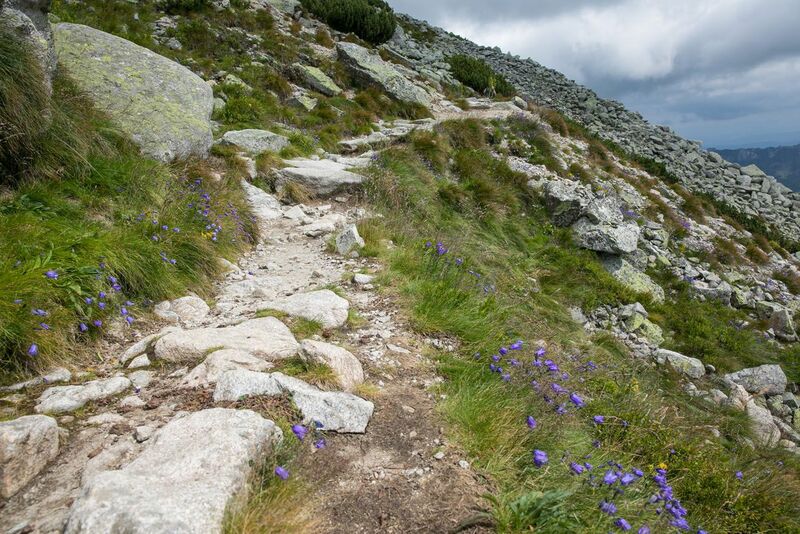 We were already sore and tired from hiking up Koscielec in the Polish Tatras yesterday, so this steep, downhill descent really had our thighs burning and our knees aching. So, even though you are now going downhill, don’t be misled and think that this is easy. It’s not dangerous, it’s just tiring. And at times it feels like it will never end. Towards the bottom of the descent, you will climb down through a gorge. There are chains to use here, since the rocks are very slick. Traffic jams can occur if the trail is busy. Then, it’s just another short downhill section. Once the trail levels out, you have just a few more minutes of walking until you get to the lodge. Our timing could not have been any better. Once the lodge came into view, big, fat raindrops began to fall. We got under cover right when the rain really started. We found an open table inside the restaurant and ate lunch, all while the skies opened up and torrential rain fell. I couldn’t help but feel sorry for the people still out there on the trail. The storm lasted about 30 minutes and then, what do you know, the skies cleared and the sun came back out. We now got to see the vivid green color of the alpine lake and the lucky ducks who get to call this home. Tim and Tyler took a few minutes to fly the drone and this is what they captured. Wow! Hiking times from the lodge back to town. Now, you will follow the yellow trail. From the lodge, it’s a long but easy walk back to civilization. It’s a steady, downhill walk, mostly along a river, so this part goes fast, which is good, since you have another 8 kilometers of hiking ahead of you. Most of the walk is under the cover of trees, so it’s cool and pleasant. But at some point, if you are like us, you will just be ready for it to be over. Towards the end of the trail, you have an option. 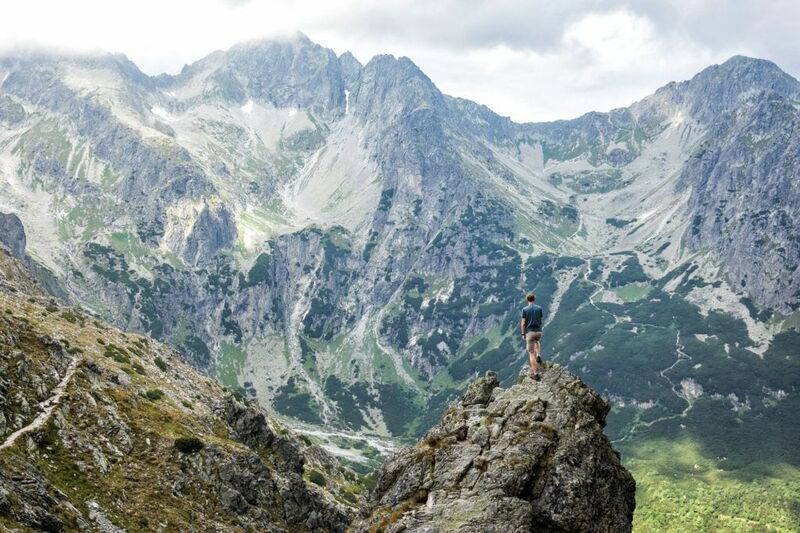 You can hike 20 minutes to the Biela Voda parking lot, located on route 537, the main road that runs between the towns along the Tatras. 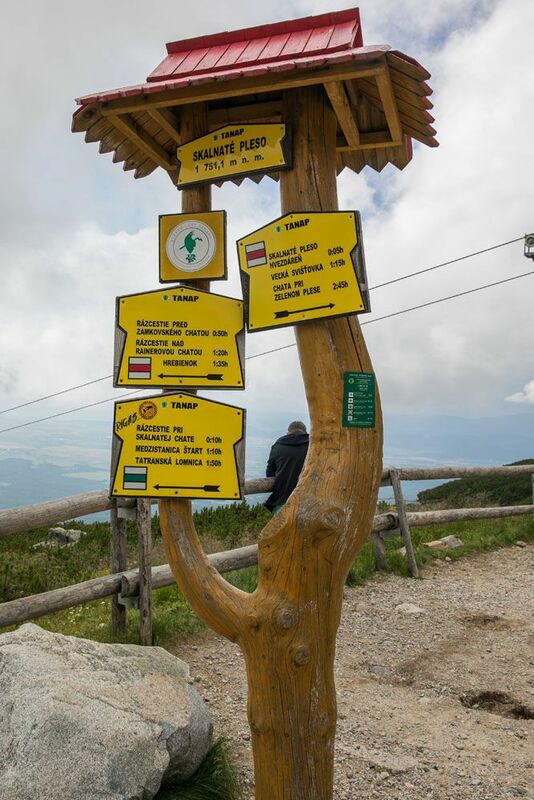 There is also a bus stop here, so you can take the bus back to Tatranksá Lomnica and the cable car station. This trail is shorter, if you just miss the bus (like we did), you could end up waiting 30 minutes until the next one arrives. Instead of waiting, we had the very nice man who runs the parking lot call a taxi for us. Five minutes and five euros later we were back at our hotel. Pro Travel Tip: Buses run roughly every 30 minutes and stop near the lower cable car station. I do not have prices but my guess is that it costs about one euro per person. 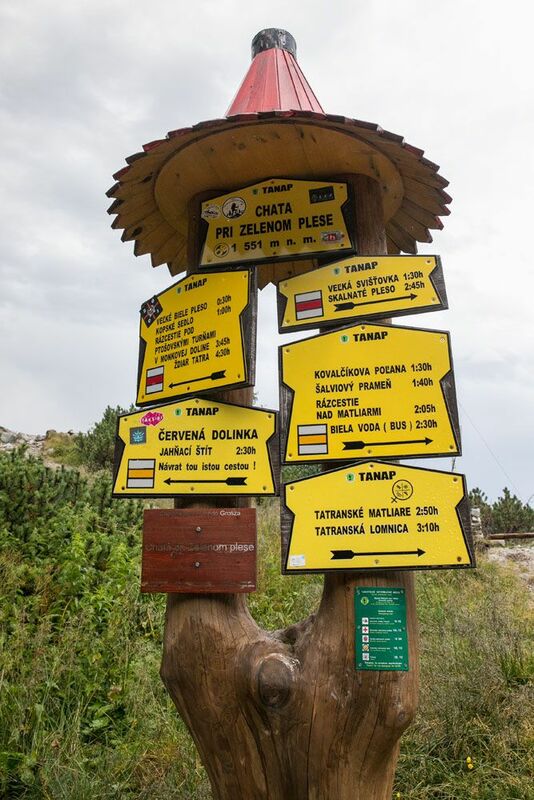 Option number 2 is to take the trail towards Tatranske Matliare. This trail continues on to the cable car station. It takes about 45 minutes to hike to the cable car station from this fork in the trail. Want to see a video of the entire hike? This includes some awesome views of the Green Lake captured by drone. Start early! Try to be at the cable car at opening time. This way, you can avoid the lines and you get an early start to the hike. Watch the weather. If thunderstorms are in the forecast, you may want to save this hike for another day. It can be very dangerous to be on a mountain peak during a storm. 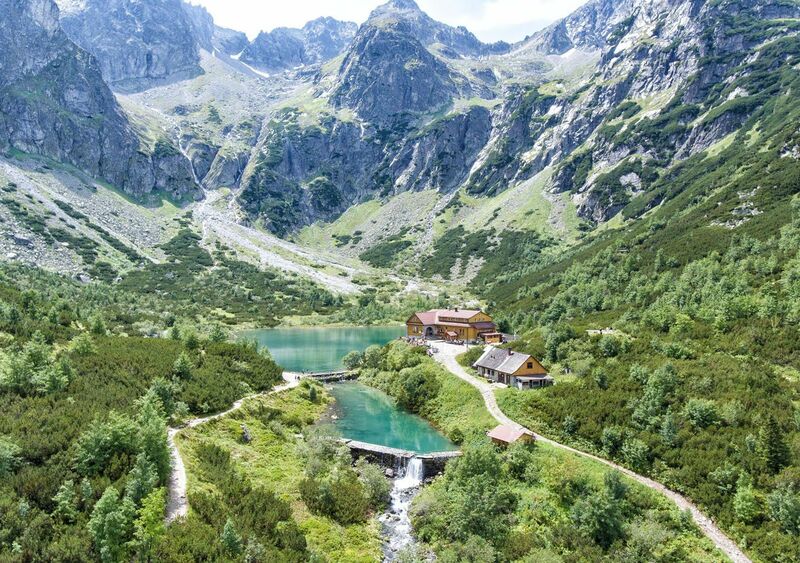 There is no cover from the time you leave Skalnaté Pleso until you get down to the valley to the lodge at Zelene Pleso. Bring lots of water, sunblock, hiking poles, lunch and/or snacks. 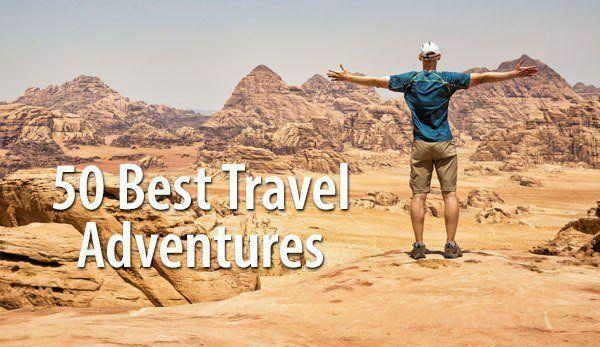 Wear hiking shoes or boots. It’s a good idea to bring a rain jacket, just in case you get caught in the rain. It can also be chilly on top of Vel’ká Svišt’ovka, so having a jacket is a good idea. If you plan to take the cable car all of the way up Lomnický Štít, bring warm clothing. It can be considerably colder up there than in Tatranská Lomnica. And don’t forget to buy your tickets in advance! You can skip the cable car altogether and hike up to Skalnaté Pleso from the lower cable car station. Simply follow the green trail up to the lake. We saw quite a few people doing this and we didn’t regret skipping this part of the hike at all. You are simply walking up a path along the cable car tracks, a rather boring hike with the same views that you get from the gondola. 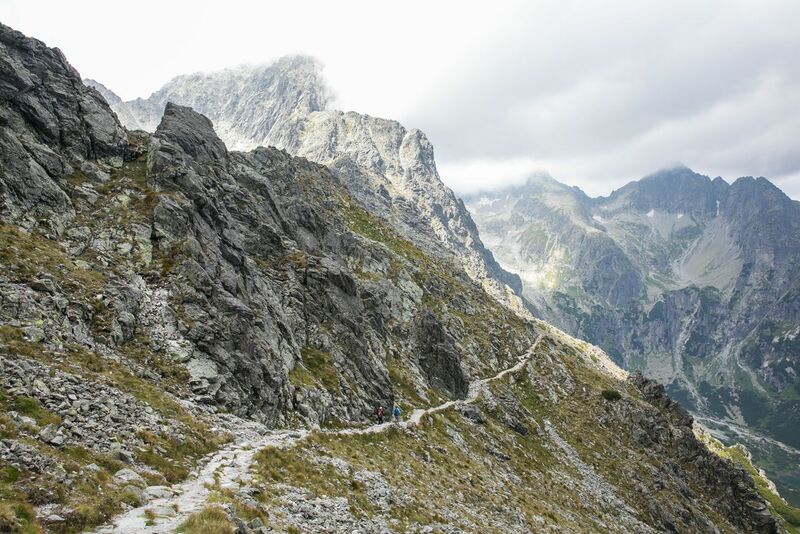 Hiking to Skalnaté Pleso adds 2 to 3 hours, 4 km (2.5 miles), and 855 meters (2808 feet) of climbing to this hike. We stayed at Villa Meribel in Tatranská Lomnica. This place is awesome! We had a two bedroom two bath apartment with a small kitchen and living area. From Villa Meribel, it was only an 8 minute walk to the cable car station, a brilliant location for this hike. 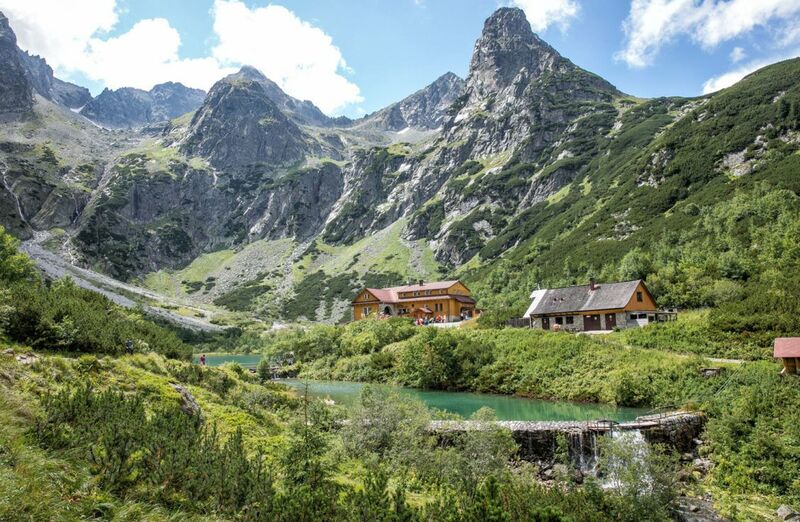 Tatranská Lomnica is a great home base for hiking the Tatras. There are several restaurants and a grocery store in town. There is also a toboggan, a great place to take kids if you are traveling as a family. 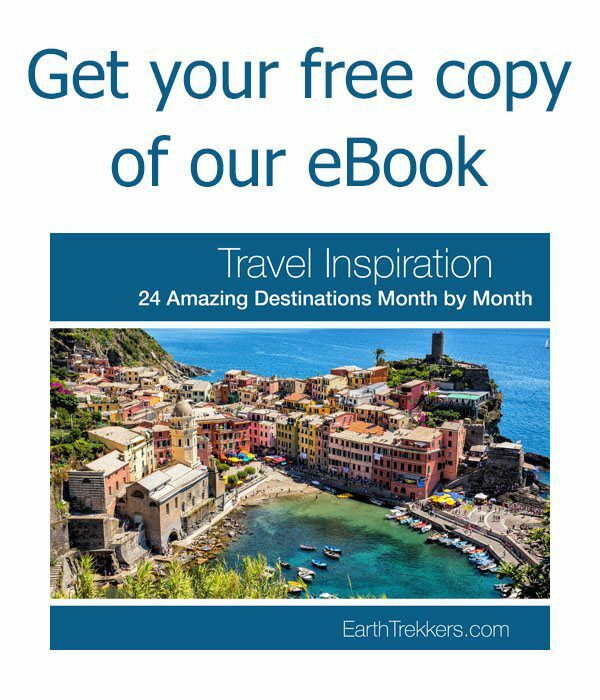 Does this look like a hike you would like to do? 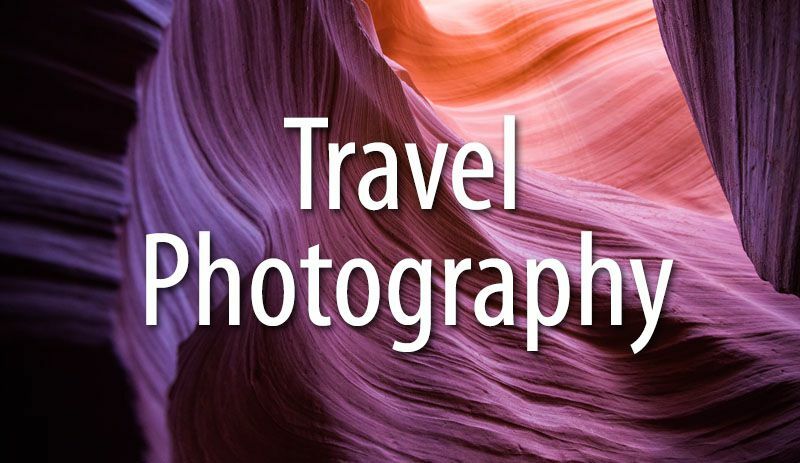 Comment below if you have any questions or advice for our readers. Hey, what a surprise! 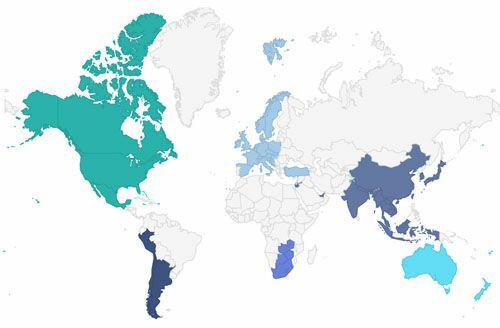 I´ve been following you, guys on your travels around the world and now, I see you in my home country! 1. 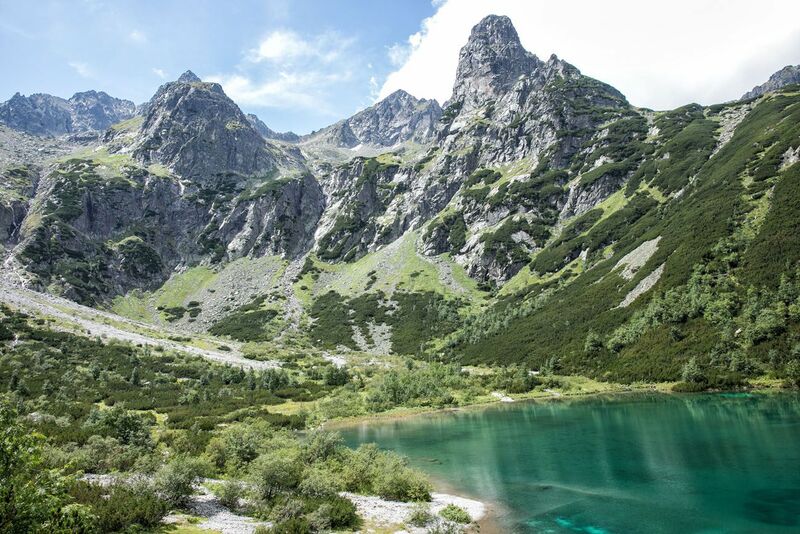 Yes, you´re absolutely right with the first leg of the hike – you can absolutely skip hiking from Tatranska Lomnica to Skalnate pleso as it is a boring part leading you up through a ski slope. 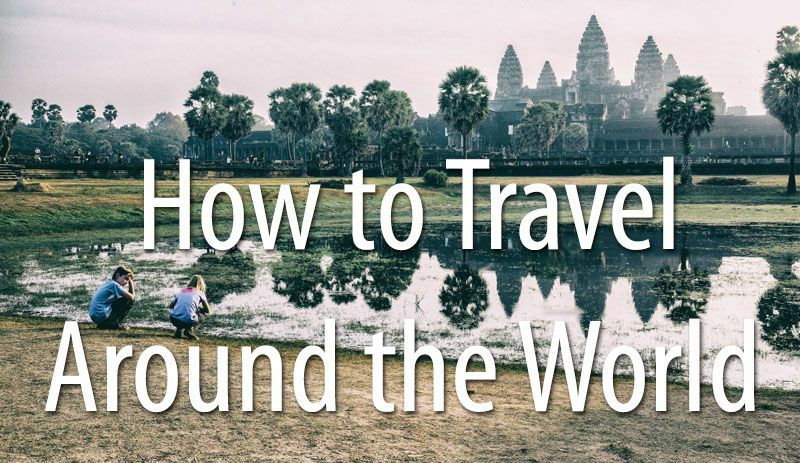 Take the cable car instead. 2. 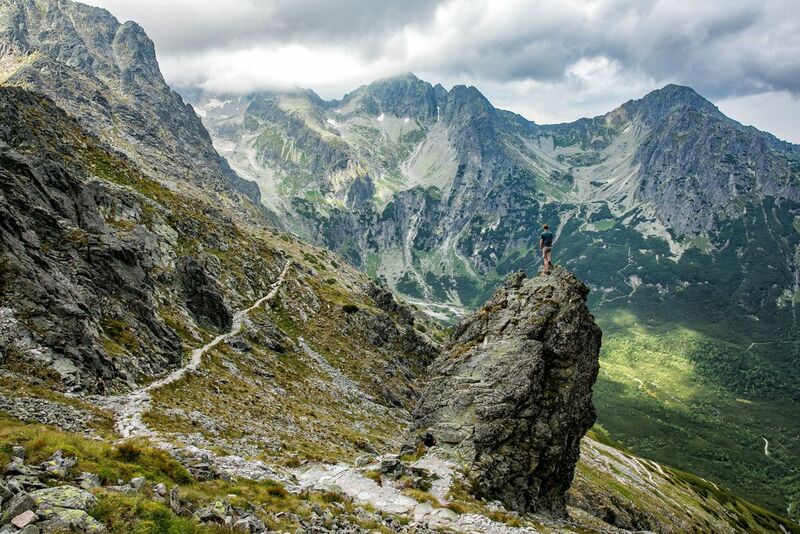 The storms are real in Tatras so planning a hike for early morning is definitely worth it. 3. 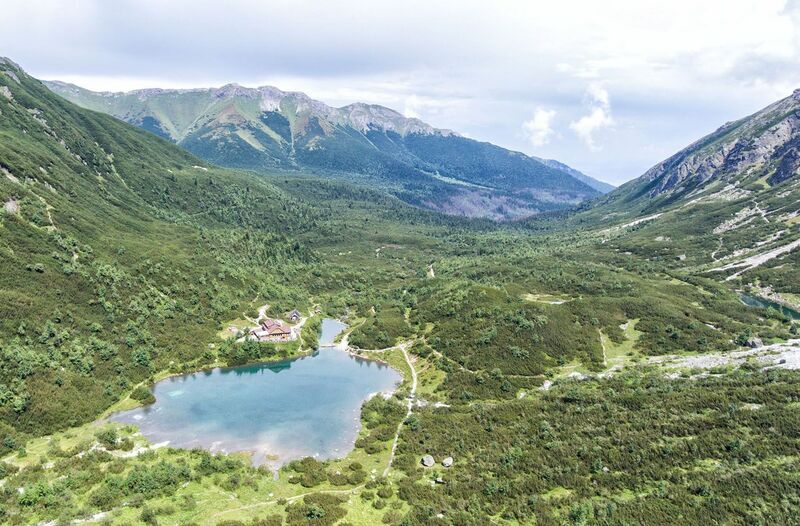 If you can spend one more day here, try to arrange a 1 night stay in the lodge of Zelene pleso and early in the morning do hike up to the mountain of Jahnaci stit which is right above it but takes up to 3 hours to get to the top. Then add another, at least, 2 hours to get down and another 3 hours to Biela Voda. We started the hike up to Jahnaci stit at 6 am, met only 1 person on the trail and several chamois…beautiful.